If you want to make Spring come a little earlier, here's a really fun project you can do with forsythia. You can force your forsythia flowers to bloom early by bringing springs of the bush indoors when they have buds on them. Simply cut pieces from the plant and put into hot water indoors. Make sure to keep adding water as the cuttings will drink it up. The only other thing you need is patience, as it will take about 3-5 days for the flowers to blossom. This should be before the flowers start to bloom outdoors (if you make your cuttings early enough). I bet this is something that your kid would love to watch as the buds open into flowers. 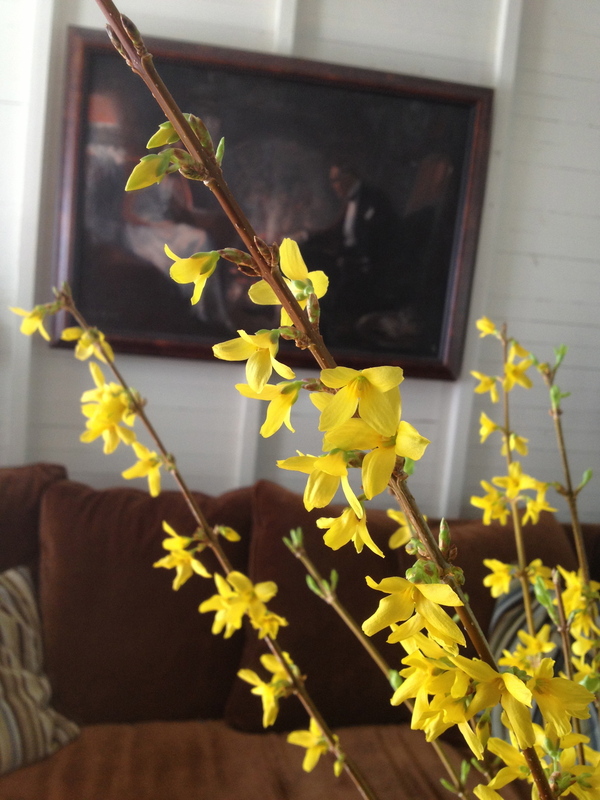 Forsythia sprigs just brought indoors. The buds are starting to open.